Weavers signed up for the challenge are: Holly, Dana, Trapunto, Rose, Julia , Desirée, Linda, Shirley, Lynne, Amanda, Esmae, Kaz, DeepEnd, Lynn, and moi. 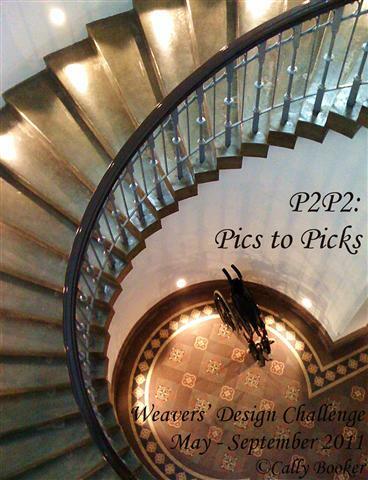 Participants voted and the challenge has been named "Pics to Picks". 2) Put all three in an envelope, and a personal message if you like. 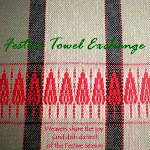 Send it to your weaver recipient. Keep an eye on your mail box for a similar envelope coming your way. 3) Plan a project based on one of the images. Whatever thoughts and images from your creative process you like. "Didn't Work" pics work, too. 5) How far you take the project depends on you. 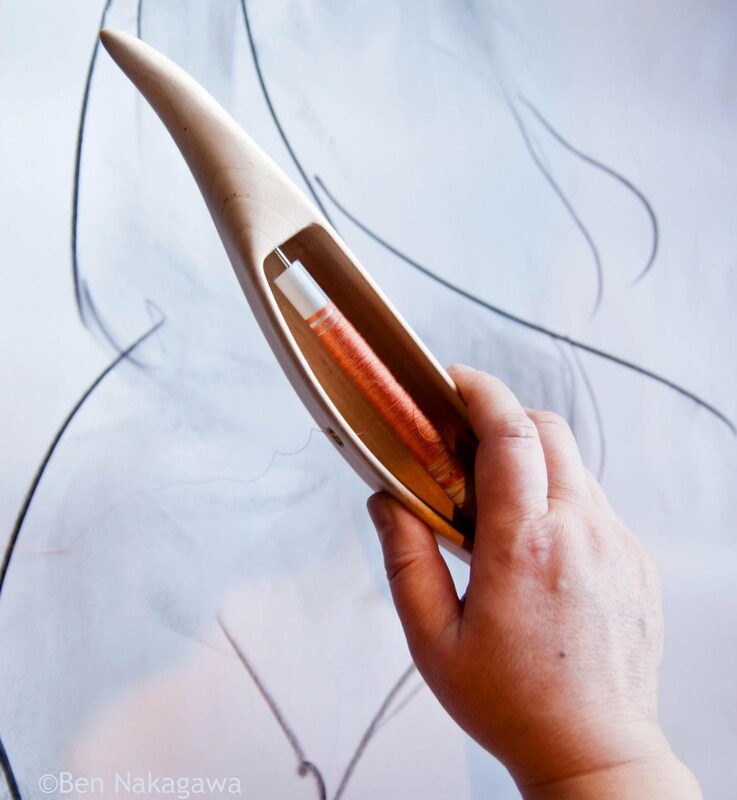 You could weave and have a finished piece, or go as far as determining the yarn, the set and the draft, or come up with a bunch of drawings and alternative project ideas. I thought paper pictures are tangible and portable and therefore preferable to exchanging JPG files. The printed papers have textures, and we could carry them around and feel them or paste them into our sketchbooks or pin them on our walls. They don't need to be printed JPGs either; postcards, newspaper or mag clipping, anything with an image. Creative weavers challenge, no Weavers creative exchange... just thinking. Not sure if it's important, but think of the acronym, too, if you like, my lovely friend. weaving excellence and via envelope ???? Weavers embellish a volatile expression? I just checked my emails and saw "wilted explanation aims very eccentric" and thought it was a junk mail!!! You're faithful to the acronym, Susan. I like "Weavers embellish a volatile expression" and "Woven embellishments attract Vixen emotions". oh I would love to participate in this! Of course, Julia. There's PLENTY of time. The BEST idea Meg! I would love to be in it! Meg, Sounds like great fun! I'm in too♥ Shirley. Lovely, Shirley. Nice to have more Aussie weavers! Lovely, Linda. I'm in this kind of Southern French mood ever since I spoke with my Sister in Law. 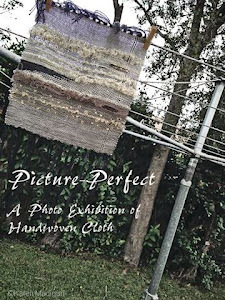 Hello I am a weaver from the UK would it be possible for me to take part? Would love to if not too late! Julie, if you can work quickly, I don't think it's too late. Please email me? Me too! I'd love to do something like this. What fun! Would it be ok if I copied your idea and did it with some other folks? Anne-Marie, maybe next year, yes? PattyAnne, of course you can, under one condition: you must let us know when and where it's happening, because I think many of us will be interested in reading about it, particularly those of us who struggled with our own this time around. Oh darn, missed this one. Am looking forward to seeing the results! Saturday Daydreaming: Or a Nighmare? ?